The 2018 NFL Super Bowl sees the Philadelphia Eagles and the regining champions New England Patriots locking horns in Minnesota. Who will win the final showdown? 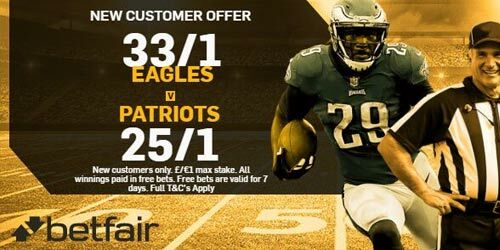 You can claim a terrific price boost on each team at Betfair - 33/1 Eagles to or 25/1 Patriots to win the Super Bowl LII + up to £100 in free bets! After a tough NFL season (you can see our NFL weekly tips here), the two best teams of the year will contest the NFL ring on Sunday 4th February 2018. Will the Philadelphia Eagles finally get their hands on the biggest prize in the NFL or can the New England Patriots lift the Vince Lombardi Trophy for a record-equalling sixth time? Make your choice and claim a huge price boost at Betfair today! Place your first bet (max £/€1) on Eagles or Patriots to win Sunday's Super Bowl! Are you looking for Super Bowl predictions? Find here our 2018 Super Bowl betting tips! Price boosts and enhanced odds are punters' favourite betting offers! Visit our Enhanced Odds section to get massively boosted prices on your favourite sports! Get up to £100 in free bets at Betfair Sporstbook: Place 5 bets of £10 or more and get a £20 free bet. You can do it 5 times! £5 No Deposit Bonus on Starburst Slot with Betfair Arcade! Cash out: Take winnings early or cut losses. Cash Out single bets and accas. Free bets awarded within 24 hours from market setting. Only deposits with credit cards or PayPal count. Other payment methods such as Skrill, Paysafe, etc.. don't count. "2018 Super Bowl Enhanced odds - 33/1 Eagles or 25/1 Patriots at Betfair"